Perched on a steep tropical hill-side above the Pacific Ocean, Vista Paraiso has a potentially great rental income. Breath taking ocean views and/ or a turnkey property management – all at a rare and attractive price point. The structure has been well maintained and has remained one of the most popular rentals in the area. The house is a sturdy concrete structure , rare hardwood floors & decking (in extremely good condition). On the top floor there is a full kitchen with and open floor plan next to the ample living area, 2 bedrooms and 2 full baths. An over sized balcony over looking the jungle and the Pacific Ocean and the infamous ¨Roca¨.The sensible floor plan is easy to maintain, secure and allows for good circulation and great view appreciation. On the first and second floor are two identical two story apartments each with a bedroom, bathroom and kitchenette. There is an upper and lower deck for continued views as well as two parking areas below the villa and beautifully landscaped surrounding yard. 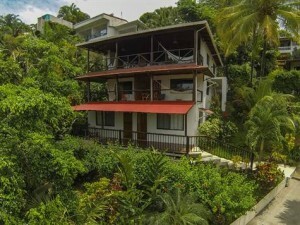 Vista Paraiso provides an A-grade location, just minutes north of Manuel Antonio park and within walking distance to some of the area’s most well-known hotels, art galleries, restaurants, a yoga, Spa and fitness studio and a few sunset bars – making it very marketable for rentals and personal usage. It’s extremely difficult to find a well maintained, ocean view property like this one.